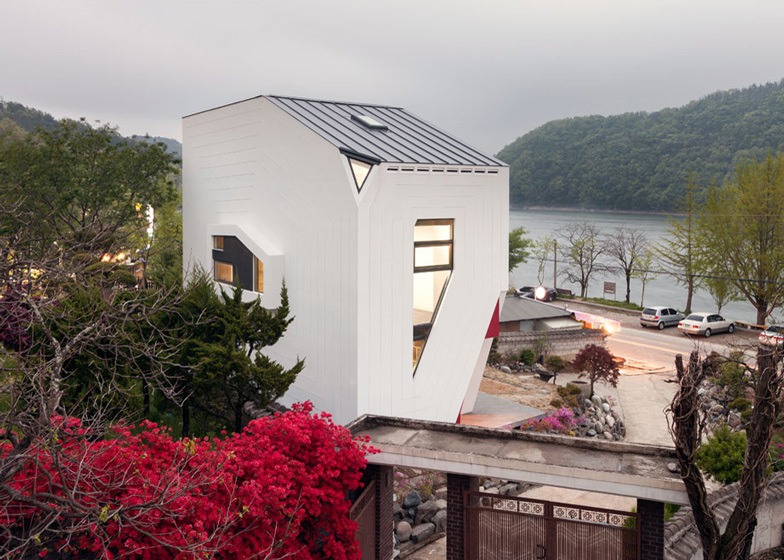 South Korean architect Moon Hoon designed this home with missing corners for a figurine collector and his family (+ slideshow). 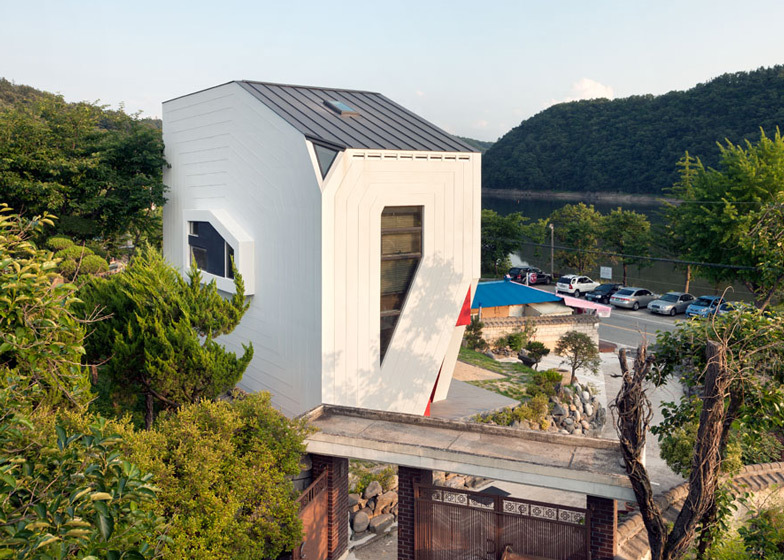 Moon Hoon designed the house for an empty plot beside a lake in Bangdong, an area of South Korea popular with tourists. "The vacant site seemed to invite some kind of a sculptural object, unhindered by its neighbours, standing rather conspicuously," said the architect. 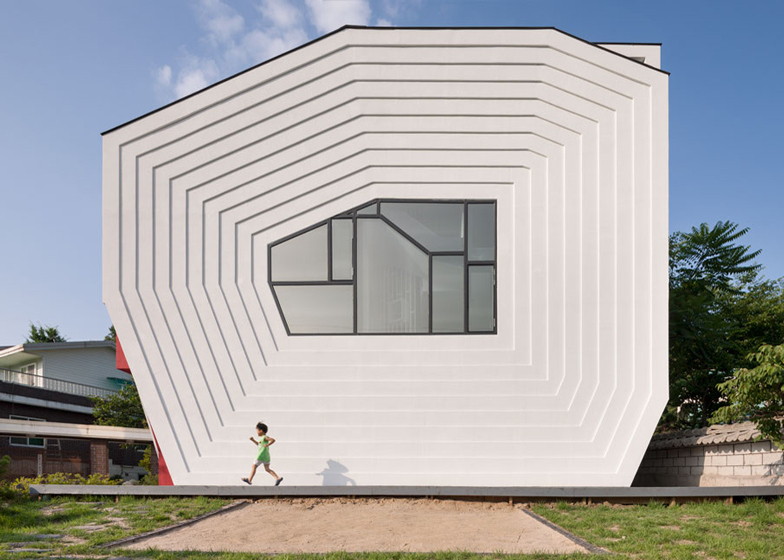 Polygonal facades are created by slicing the corners off a narrow cuboid. On each wall these outlines are repeatedly scaled down and recessed until they form windows in the centre. 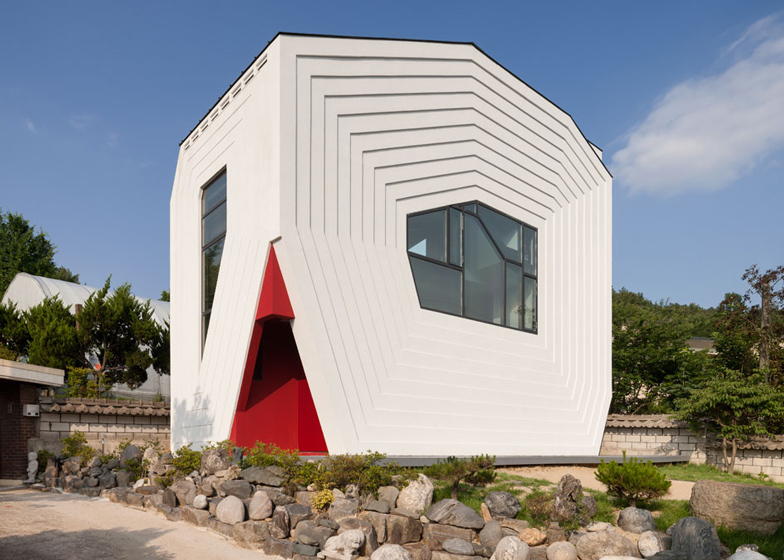 Conan House, which translates as Toy House, was designed for a local TV producer who wanted somewhere to display his toy collection. "He is an avid collector of miniature robots and figures," said the architect, "a hobby that started from an early age that has not stopped." 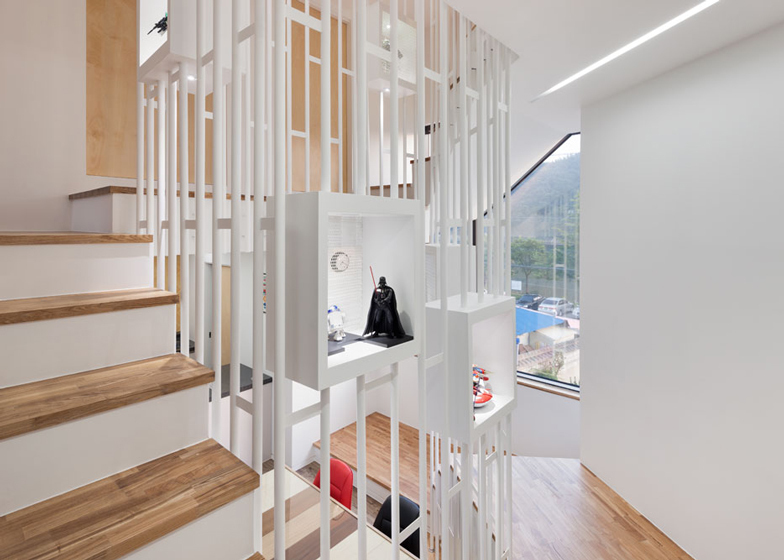 Hoon created square niches in the railings that surround the central staircase to display the best objects in the client's collection. The staircase spirals up the centre of the building around a skylit atrium, dotted with the display cases all the way up. More paraphernalia is stored on a wooden bookcase in the basement that nestles in the bottom of the stairwell and wraps around a study area. Moving up the building, levels are staggered to separate the entrance and living room from the dining and kitchen area. The main bedroom and ensuite bathroom sit a few steps down from two children's rooms that share a window. 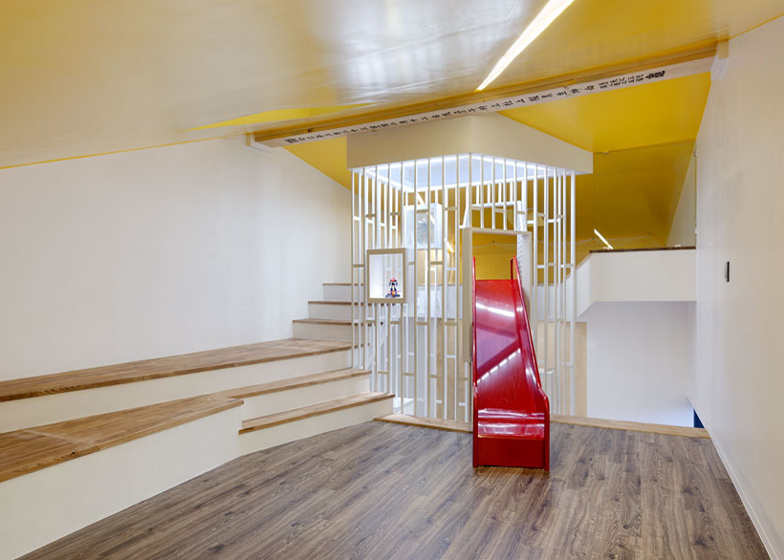 A red slide cuts across the atrium to join the play areas split over the top floors, which have a yellow ceiling and are lit by windows in the sliced-off corners. 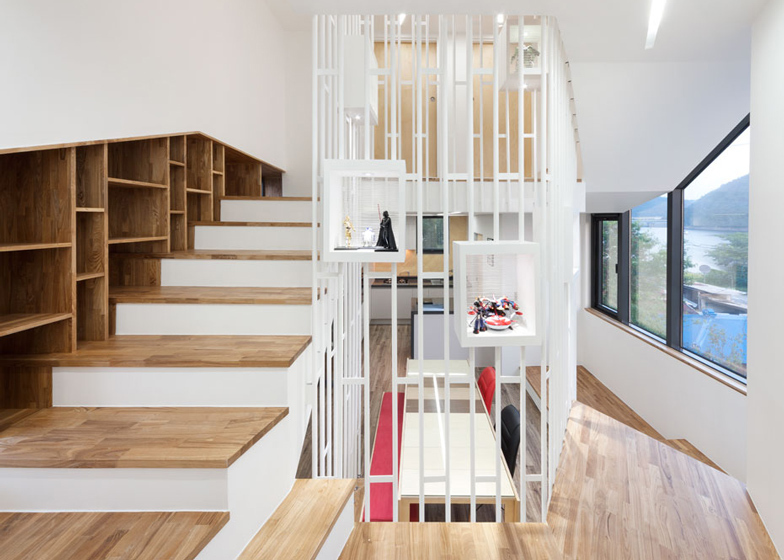 Wooden floors and stair treads run throughout the dominantly white interiors. The entrance is through one of the cleaved wall junctions, easily noticeable from the outside as it's painted red. 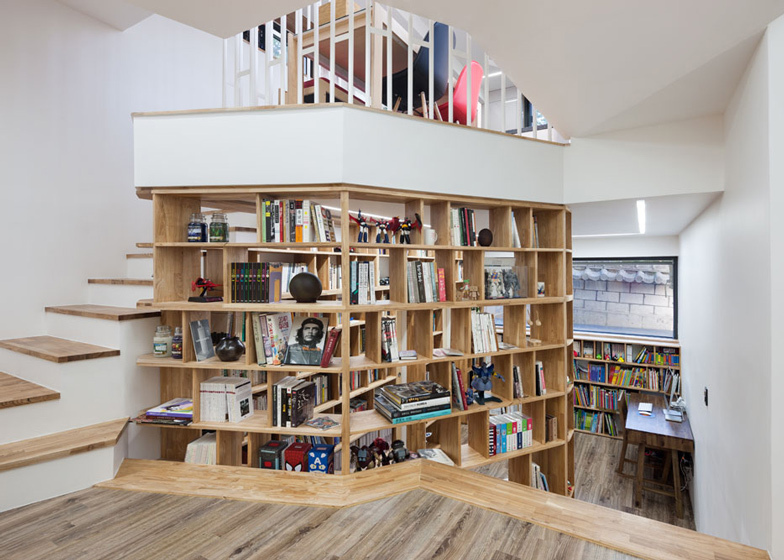 Moon Hoon has also designed a house with a wooden slide slotted between a combined staircase and bookshelf. Photography is by Nam Goung Son. Bangdong is a famous place for sight seeing and leisure for nearby dwellers. It can be quite crowded during the holiday seasons. The irregular plot of land situated right in front of Bangdong lake boasts a beautiful open view of the lake and a low mountain as a back drop. When visited for the first time, the vacant site seemed to invite some kind of a sculptural object, unhindered by its neighbours, standing rather conspicuously. He is a producer for a local TV station, with one kid and a lovely wife. His family visited my office one day and asked for a skip-floored house like Lollipop House, which they had seen in the magazines. He was an avid collector of miniature robots and figures. A hobby that started from an early age, which has not stopped. His father was also an avid collector of natural stones shaped like something recognisable or possessing some abstract qualities. The collector gene was running in the family. I am a playful architect. I have met the right client, who has kept his child-like mind intact with him. 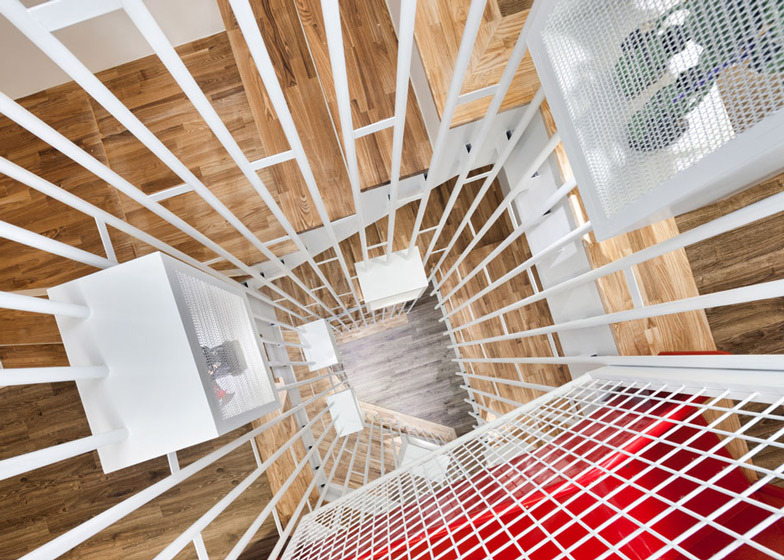 The design went through two alternatives, one each floor stacked and rotating, the other of a box with small broken floors moving up in a spiral. Both had their ups and downs. The client chose the latter. 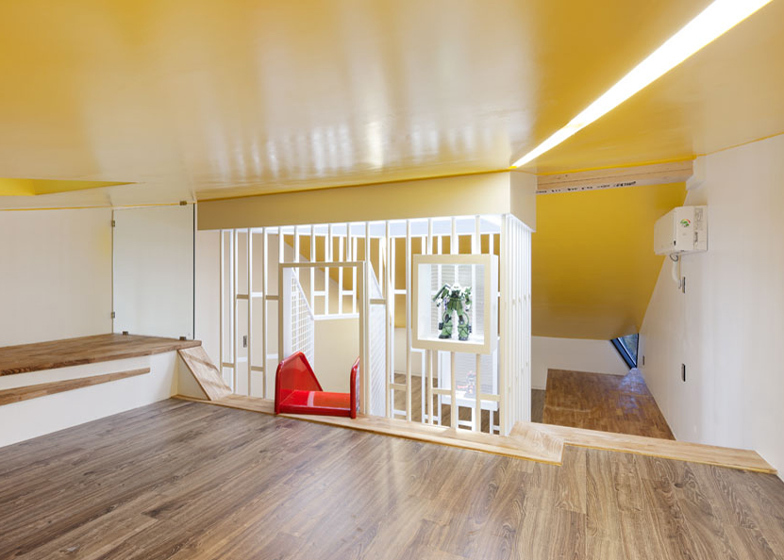 The house has a central core that is used as an exhibition space and a railing for his toys. 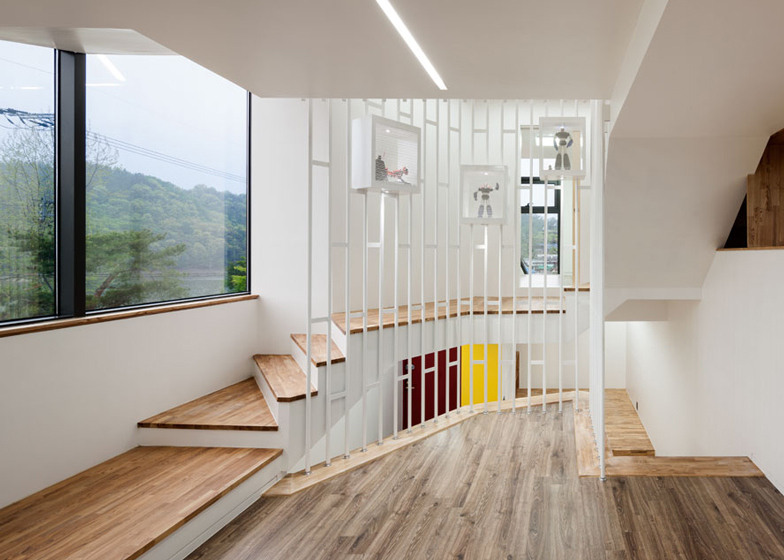 The spiral and jagged floor levels follow the spiral stair case all the way up to the attic, where you can find a small red slide that traverses the void. The exterior expresses the inner spiral energy in a simplified form. 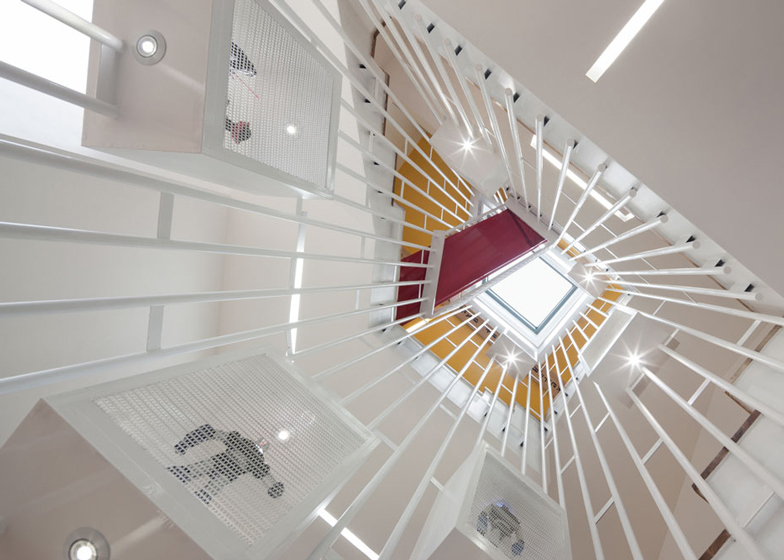 The spiral staircase is a place for movement, play and exhibition. It plays a central role in the house. the other functioning rooms such as living, kitchen, bedrooms are attached to the system. 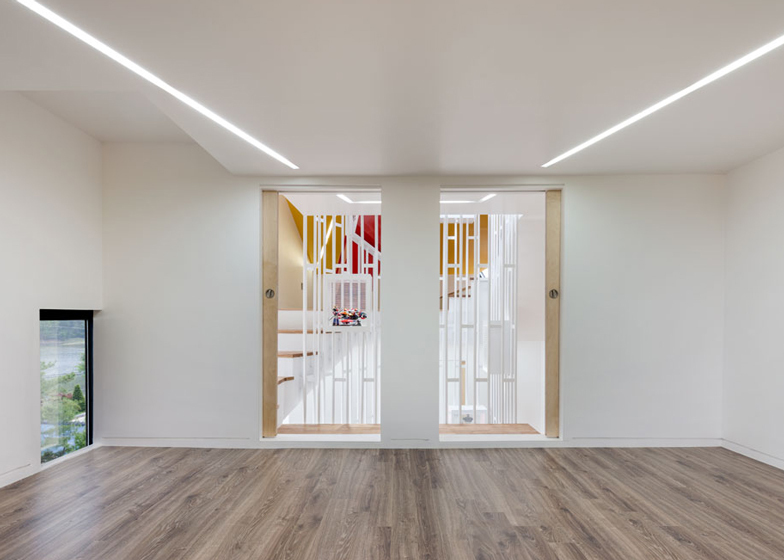 The windows are placed in the centre of each wall, mimicking the concept and inviting ample amount of light. 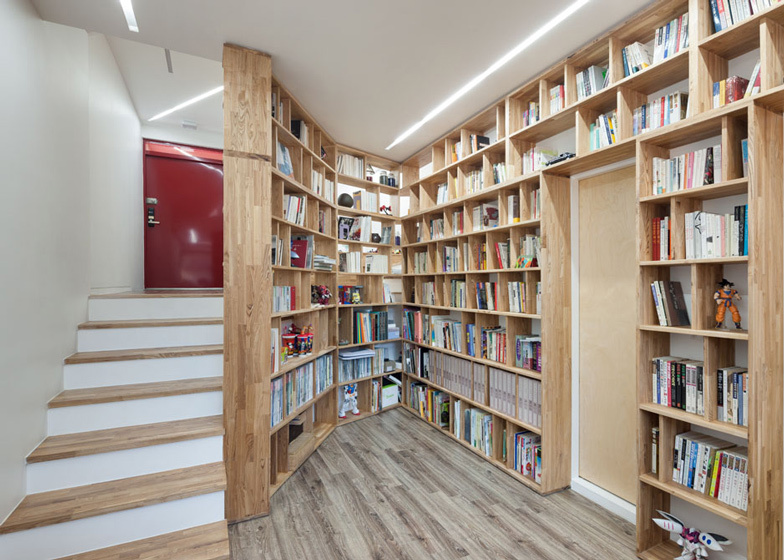 The void in the middle gives much vertical depth in a otherwise a compact house.